Looking to get all the updates for the launch of the G1 in a single place? We're following a bunch of sites, namely: Engadget, Gizmodo, Android Community, BGR, and of course the live feed. We're going to collate all the news after the break. Stay tuned, we're starting at 10:30 EST! New Updates at the top! 11:12: The speed difference on a web search between a laptop and a phone is still pretty big. But being able to do it on a phone as quickly is a really really big thing. Gosh, Google is excited about search, what a surprise! 11:11: 3 Billion mobile phones, a billion more per year. The G1 is as good a computer as what you had a few years ago. Think about what that means for what the internet is. 11:10: Literally rollerbladed in. They're geeks, like tinkering with things. Has one there. First application he wrote is you can throw the phone in the air and it measures how long it stays in the air. Heh. 11:09: Larry Page and Sergei Brin surprise us on stage! 11:08: Supports AAC, WMA, MP3, not iTunes DRM though. Skype... not yet. It's a dual-band UMTS, Quad-Band EDGE so it will work worldwide. 11:07: Joel Evans of Geek.com: Why not focus more on GMail? What's the client like? Robust Gmail -- same threading, archiving, labels, search, it's very fast. A pretty good GMail on a small platform. Email services integrated through a gmail-powered front-end, but still can work with others. 11:06: Who is the target demographic? Mass appeal, something for everybody. Expect it to be more consumer than enterprise. 11:05: does it use Chrome browser? Nope... uses webkit, though. Think of it as "chrome lite." Hm..
11:05: Matt Miller, ZDNet: more on the sync, how does that work? Bluetooth A2DP, Keyboard? Google and T-Mo have developed an integrated marketing plan. TV, Channels, etc. Will be marketed starting in october, biggest ever for T-Mo. 11:03: SIM-lock again. What's the deal with that? Do you expect there will be an unlock fight like there was with the iPhone? There's no guarantees with Technology. Worth noting that $179 is an attractive price (um)... but can't obviously address the question. 11:02: desktop for syncing picture, info? Nope, not initially. All the sync happens on the backend with the network. 11:02: Any PUSH email at all? 11:02: support for MS office files, MS Exchange, SIM-Locked to T-Mo? 11:01: Will this function as a tethered modem? Can you just get the data plan. All-in-one device, not a tethered modem. Data plan will require a voice plan. 11:00: HTC wanted to be on this launch because of long-standing partnership with T-Mo and Google. 2, wanted to make mobile internet a reality, 3rd is HTC's leadership in innovation. 10:59: Open sourcing the entire platform. Pretty focused roadmap, going broader with more features and functionality. 10:58: In Europe (bigger market). UK in early Nov, across europe Q1 2009. 10:58: 3G on T-Mobile. Up live now in 16 markets, by Oct 22nd they'll be live in 22. By mid-Nov they'll be in 27 markets, about 80% of their customers, all the major US markets. 10:57: $179!! One Seventy Nine! T-Mo customers can order over the internet NOW, will ship when it's available. Available Oct 22nd. Very cheap!! $25 for unlimited web and internet and some messaging. $35 for unlimited EVERYTHING (except voice). 10:56: Brodman is done. It's Question and Answer time. How SWEET that they're willing to do an open Q&A at this launch event? Open? Open. 10:55: 3rd party partners. EcoRio -- lets you track your carbon footprint. ShopSavvy. Take the G1, turn it into a barcode scanner, scans any good with the camera, looks it up on the internet, and finds competitive pricing. Mentions how it will help with the tanking economy. Heh. 10:54: Expect to see a continuous stream of innovation because it's open source. Showing everybody from dorm-room hackers to larger corporations. 10:52: 3rd parties will drive innovation and the future of the mobile internet. ANOTHER video?! Man, you guys are really worried about your ability to hold a stage presence. Video is about open source, interviewing several developers. 10:51: Video is done. Brodman asks for applause. Promise of open development environment and 3rd party developers. Again -- really glad to hear this stuff. 10:50: Android Market App store. Easy to download. Easy to sort with user ratings and reviews. 10:49: Browser time! Looks very close to a full desktop browser. On-screen controls for zoom -- not quite as elegant and multi-touch on the iPhone, but still pretty cool. Good tab support. Dedicated Google Search button -- nice! Google Search is location-aware too. 10:48: Compass mode: sweet! Street view that can move with you. 10:47: really terrific music player, long-press gives you related material on the MP3 store! Multi-tasks (take that, iPhone!). Showing keyboard, instant messaging. Type-to-find in contacts. Address book and map integration. Directions and traffic view. Full street view support. 10:46: New video. Touchscreen, swipe to different desktops. Long-press to open up a secondary menu. Easily pan, crop, frame, and add to home screen. You can drag and drop any application to your homescreen. Music -- showing the Amazon mp3 store with one-click ordering. 10:45: Time to actually talk about the device! 10:44: Just the teaser reel, they're letting people come forward to take photos. 10:43: showing a video. My GOD it's FAST. They are cutting to lots of features really REALLY quickly. 10:41: Talking about the importance of the Open Alliance and how 3rd parties help with the mobile internet. ok, finally, let's see it. PLEASE. 10:40: Cole Brodman back on the stage. Round of applause for these 4 guys. Brodman talking up need for applications that actually use the internet. "US Consumer over-consume everything, we love that about them." 10:40: Android is nimble, flexible, and powerful. A fundamental shift in how people can be shown the internet. 10:39: You need applications and content that introduce internet experience that people can really use and enjoy. HTC has worked closely with Google and T-Mobile to develop a unique, iconic design unlike anything else in the market. 10:38: Chou is the MAN, if you guys didn't know. He makes Steve Jobs look like un-creative when it comes to the mobile space. Seriously. Smart Man. He's going through the same motions as the previous guys, though, thanking everybody. 10:37: Andy Rubin takes the stage. Talking about Google being founded on the Internet. Developer will be able to use it as a platform, because it's openness a developer can modify the platform and make it better. It's "future proof" becuase it has openness built in. Peter Chou next! 10:36: "Committed to open industry platforms." God it's nice to hear that from a carrier exec and know that there's actually some TRUTH behind it! 10:35: History of T-Mobile as opening up the mobile internet. In 2005 they opened up first.. Hunh? I guess this means that we'll never see T-Zones again. Talking up T-Mo's $$ side (they are last, after all). Partnerships are important, expressing gratitude to Google and HTC. 10:33: World's first Android-based mobile phone. T-Mobile G1. Launching the same device simultaneously on both sides of the atlantic -- a first for T-Mo. 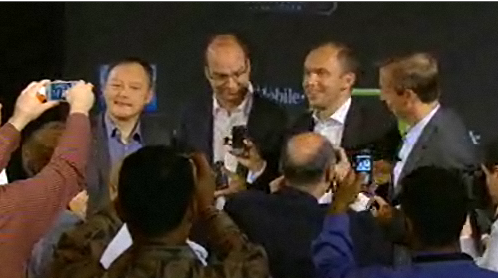 "At the end of this very year"
10:32: Bringing on Christopher Schlepper, Andy Rubin, and Peter Chou. Christopher to start. 10:31: Promotional video... the entire plant. T-Mo CTIO Cole Brodman takes the stage. Need to connect to one another. Integration of cell phone and internet has failed us in the past, "we're here to today to change that. A new platform, a new device, a new set of services." 10:30: Seems like a perfect time for the live video stream of the event to go down. ...and there it goes. 10:29: oh boy oh boy! Are we gonna get going or what? 10:17: still waiting. What's your most-hoped-for "I didn't expect that!" feature? 10:12: We're waiting, though the "BEEEEEEEEEEP" on the live feed is getting awfully annoying. Ah, here we go, now we have just plain music -- aggressive guitar rock, which doesn't really seem to be either Google's or T-Mobile's style. Ah, now it's generic elevator music.